UPDATE: DEADLINE EXTENDED UNTIL FEBRUARY 1, 2019! Enter now for your chance to be featured in COUNTRY ROADS MAGAZINE Winter issue and to win one of our great prizes. 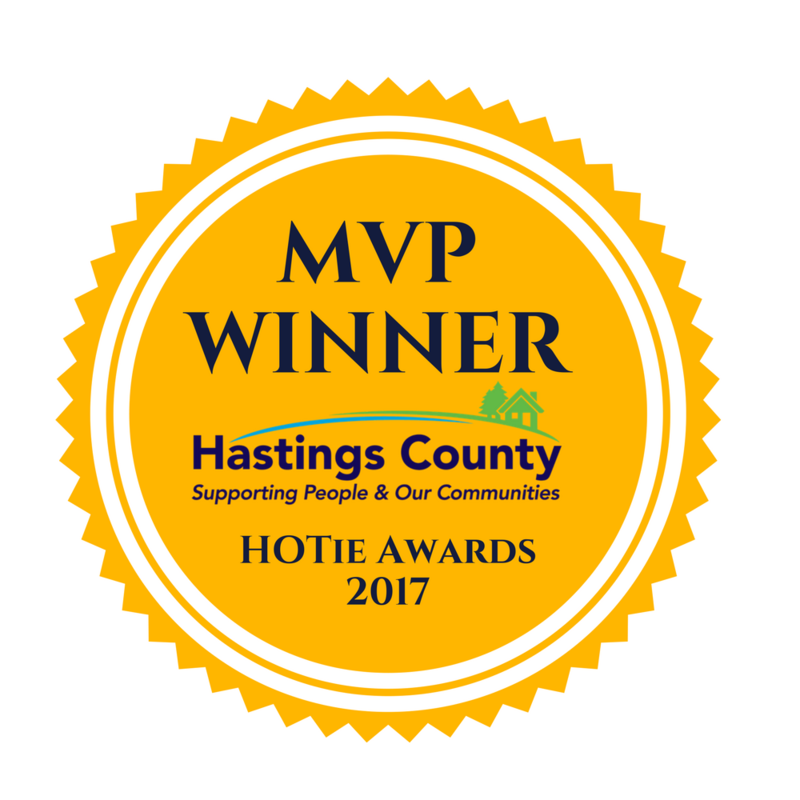 Photos must have been taken within Hastings County. 1. Email your photo, in jpeg format, to nancy@countryroadshastings.ca with PHOTO CONTEST and your name as the subject line. (Note: digital files should be at least 5 megapixels, or 2560 x 1950 pixels; image quality setting: high.) The maximum file size is 10 MB. Photos that do not meet the requirements will not be accepted. MAX. 3 ENTRIES PER CATEGORY. Select the category to which you would like to submit. * Note: You will have the chance to submit more than one photo, if desired. GENERAL CONDITIONS: No correspondence will be entered into except with the selected winners. This contest is subject to all applicable federal, provincial, and municipal laws. Void where prohibited by law. The decisions of the editorial staff with respect to all aspects of this contest are final and binding on all entrants without right of appeal. Selected winners (or winner’s parent or legal guardian if winner is a minor) will be required to sign and return a standard Declaration, Liability and Publicity Release, releasing the Sponsor, prize suppliers, and their respective advertising and promotional agencies, and the editorial staff, from any and all liability arising directly or indirectly from this contest, participation in contest related activities, the awarding of a prize, and the use or misuse of any prize. By entering the contest, selected winners agree to comply with these official contest rules and agree to the publication, reproduction, and/or other use of his/her name, address, voice, statements about the contest, and/or personal photograph or other likeness without further compensation, in any publicity or advertisement carried out by the Sponsor in any manner whatsoever, including print, broadcast, or digital. The Sponsor, its advertising and promotion agencies are not responsible for late, lost, misdirected, or delayed entries. Without limitation, the Sponsor, its advertising and promotion agencies will not be liable for the failure of any entry or Photo to be received. The Sponsor reserves the right to withdraw or amend this contest in any way, in the event of an error, technical problem, tampering, unauthorized intervention, fraud, technical failure, or any other cause beyond the reasonable control of the Sponsor that interferes with the proper conduct of this contest as contemplated by these Rules. Any attempt to deliberately undermine the legitimate operation of this contest is a violation of criminal and civil laws, and should such an attempt be made, the Sponsor reserves the right to seek remedies and damages to the fullest extent permitted by law, including criminal prosecution. The Sponsor reserves the right to cancel or suspend this contest in the event of any accident, printing, administrative, or other error of any kind without prior notice or obligation. By entering this contest, each entrant expressly consents to the Sponsor, its agents and/or representatives, storing, sharing, and using the personal information submitted with his/her entry only for the purpose of administering the contest, unless the entrant otherwise agrees. Please provide the following info for each photo you are entering in this category: title, short description, location and filename. 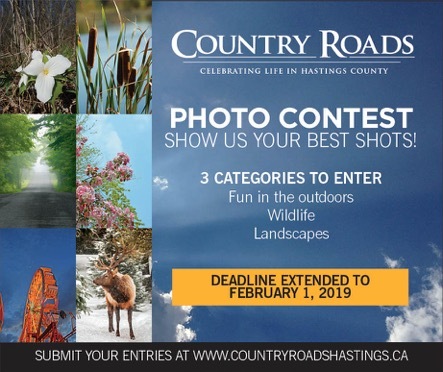 Email your photo, in jpeg format, to nancy@countryroadshastings.ca with PHOTO CONTEST and your name as the subject line. (Note: digital files should be at least 5 megapixels, or 2560 x 1950 pixels; image quality setting: high.) The maximum file size is 10 MB. Photos that do not meet the requirements will not be accepted JPG files only No watermarks No cropping No filters applied If you would like to submit additional photos in another category, please do so in a new entry form. Sponsor: Country Roads Magazine, a division of PenWord Communications Inc.
FEBRUARY 1, 2019, at 11:59 p.m. ET. (the “Submission Deadline”). To enter, visit countryroadshastings.ca to complete the entry form and email your digital file. Digital entries only will be accepted. Print entries will not be accepted. Entries will be rejected if the entry form is not fully completed and the entry is not received by the Submission Deadline. Digital files should be at least 5 megapixels, or 2560 x 1950 pixels; image quality setting: high. Colour correction and tonal cast changes are acceptable; compositional changes, as well as added watermarks or signatures, will result in automatic disqualification. Entries that do not meet technical requirements will be automatically rejected. If a Photo is chosen as a winner, all original material, including digital capture files, must be made available to Sponsor as a condition of receiving a prize. Prize winners agree to have winning photos published in Winter 2018/19 issue of Country Roads magazine and Sponsor’s social media outlets. Entrants 13 years of age or younger must have consent from their parent or legal guardian to enter this Contest. In the event it is discovered that you entered without consent from your parent or legal guardian, all entries will be void. Entries are limited to individuals only; commercial enterprises and business entities are not eligible to enter the Contest. You must have taken the Photo that you submit for the contest. You will require the consent of all individuals who are included in the Photo and consent from the individuals who own the personal property (i.e. the cottage) featured in the Photo. By entering the Contest, you represent and warrant to Sponsor that the Photo will not violate the rights of any third parties or any applicable laws. Entries not complying with these contest rules will be disqualified. If the winner is a minor in his/her province, territory of residence, such winner’s parent or legal guardian must accept the prize on his/her behalf. Editorial staff of the Sponsor will judge all Photos submitted on the basis of originality, creativity, technical proficiency, and uniqueness appropriateness, and relevance to the category of submission. Photos which are illegal, defamatory, or in any way obscene, all as determined solely by the Sponsor, will be disqualified. Judging will be completed and the winners contacted by November 15, 2018. If you have not been contacted by this date, you may assume that your entry is not a winner. Odds of a Photo being selected by the contest judges as the winner of a First, Second, or other Prize depend on the number and calibre of entries received in each category.